With modern technologies and so many advancements in arthritis care, you'd think that the instances of the disease would be decreasing. Not so, according to a recent story published in Science magazine. A new study depicts how arthritis of the knees in particular, has doubled in Americans dating back to the start of World War II, from six percent to 16 percent since 1940. Researchers gathered data from more than 2,500 skeletons, some as old as 6,000 years, to make this observation. Knee arthritis is one of the leading causes of disability and immobility, with nearly 20 percent of Americans over the age of 45 suffering from it. So it’s important to understand the nature and progression of the condition. When knee arthritis, or osteoarthritis, sets in, the cushiony cartilage between joints breaks down leaving a painful sensation with the bone grinding on bone. The scientists in the study examined whether or not there were smooth patches between knee joints signifying a loss of cartilage, and thereby pointing to a potential diagnosis of arthritis during that person’s lifetime. Initial thoughts from the study indicate that as people are living longer, their bodies have a greater chance of deteriorating and being affected by some sort of debilitating illness or injury. Another theory is that Americans are more sedentary than ever before, leading to an increase in obesity, which puts great pressure on cartilage and joints causing them to wear down. Centuries ago when people relied more heavily on physical labor to survive (hunting, farming, etc. ), joints may have been healthier due to the active lifestyle. To help prevent the onset of arthritis, Texas Orthopedics encourages people of all ages to engage in some form of exercise or physical activity each day to keep joints lubricated and flexible allowing for the growth of fresh and abundant cartilage. 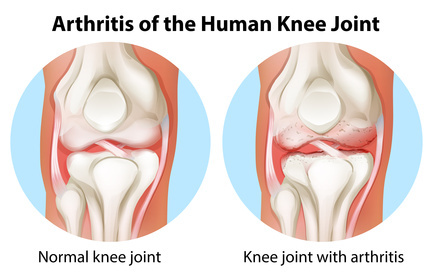 If you have signs of knee arthritis, such as joint pain or stiffness, please contact us for an appointment.